Known as LASIK or Lasik (Laser Assisted in Situ Keratomileusis), this is one of the most patronized refractive surgery options in the world today. This method of refractive surgery is popularly used for laser vision correction and laser eye surgery. It is also the best method for eye correction of refractive errors such as myopia, hyperopia, and astigmatism. The goal of this surgical method is to reduce the dependence on prescription eyeglasses and contact lenses. According to studies, the Lasik is the most common form of laser eye surgery and it is suitable for about 90% cases. When it comes to undergoing Lasik form of laser eye surgery, it is important that you recruit the services of a competent Lasik Specialised Surgeon. Some of the advantages of the Lasik procedure over other methods is the fact that it offers less discomfort and recovery time is speedy with some reports citing 24 hours healing time. How is Lasik carried out? The Surgeon uses a laser to create a very thin, circular flap of tissue in the outer area of the cornea. This flap is folded back to expose the bed of the cornea, before the laser removes a precise, pre-set amount of corneal tissue. The flap is replaced and is almost instantly held in place by the natural processes of the eye. In most cases, the flap will have effectively healed within a few hours. When it comes to the correction of astigmatism, Lasik is a preferred method because it helps to correct it by straightening an irregular shaped cornea into a more regular shape. There are other forms of Lasik known as the Bladeless Intralase Lasik, and the Traditional Lasik. Other alternatives such as EpiLasik and PRK are employed in cases whereby the patient has thin cornea or in situation whereby certain health problem makes them not fit for LASIK surgery. Why is the Lasik method of laser eye surgery a more preferred option? There are several reasons why lots of people are opting for a Lasik method of laser eye surgery notwithstanding its cost. One of the major reason is the healing time. 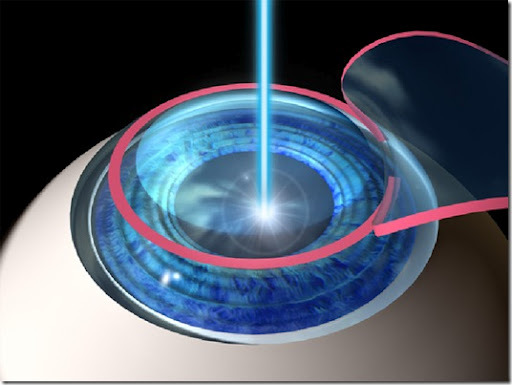 Lasik method of laser eye surgery offers one of the fastest healing time, one can think of. With reports citing 24 hours and the patient ability to drive home immediately after the surgery. Also, with the introduction of a recent technology known as the Bladeless Lasik also known as femto-LASIK or iLasik, which makes use of laser technology to create the flap on the cornea, like the flap that is formed by the keratome in standard LASIK surgery. Also, with the introduction of the All Laser Lasik method which uses a special femto-laser, the flap can be created completely by a precise laser, which treats to a more exact location, shape and depth.